Teachers play a key role in the school system and in shaping the future opportunities of children and adolescents. 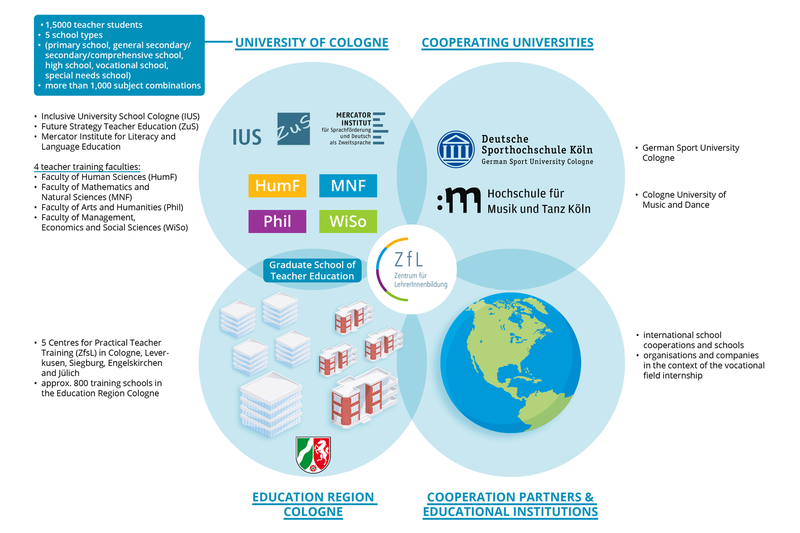 The University of Cologne is one of the largest teacher training universities in Europe. Around 14,000 students are educated at four faculties (Faculty of Arts and Humanities, Faculty of Human Sciences, Faculty of Management, Economics and Social Sciences and Faculty of Mathematics and Natural Sciences) and two cooperating universities (German Sport University Cologne and Cologne University of Music and Dance) for all five school types in over 1,000 subject combinations. They account for about 29 percent of all students. In addition to the faculties, a number of specific and interdisciplinary institutions are actively involved in teacher training. In recent years, a network has therefore been created which cooperates within the university but also with schools, the Centres for Practical Teacher Training, the District Government Cologne and the city of Cologne as well as with educational institutions on a national and international level. At the interface between research and teaching on the one hand and practical professional relevance on the other, the Centre for Teacher Education is responsible for supporting and accompanying students during their teacher training.